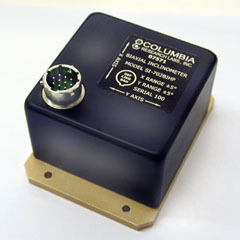 The Columbia Models SI-702B and SI-702BHP are biaxial electronic tilt sensors based upon force balance accelerometer technology. They produce a high-level low-impedance output proportional to the sine of the tilt angle. Unique electronic damping and desensitization circuitry allows tilt measurements in strong vibration and shock environments. These inclinometers are self-contained requiring no additional signal conditioning in most applications. The Model SI-702B is well suited for many OEM and industrial applications requiring dual axis tilt measurements. The Model SI- 702BHP uses the Columbia patented HP suspension system and provides added accuracy and ruggedness. These sensors are intended for applications such as platform stabilization, surface mapping and measuring tilt angles in remote locations. Consult the factory for customized versions of these sensors.